Can be separated into one twin and one full size bed. The foot board on the top bunk will have a gap that is the entryway for the ladder. Built-in Stairway instead of ladder for easy access to the top bunk. Bunk Bed can be assembled so that Stairway is on either left or right. Full Trundle provides additional Full Bed - so 3 Beds in all. White finish is child safe. Solid Brazilian Pine - no particle board. 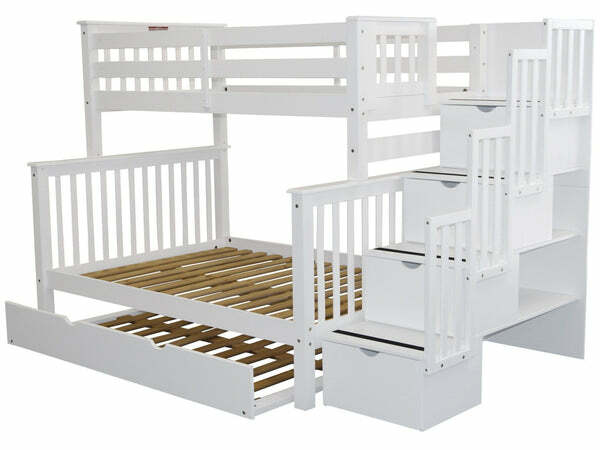 Sale is for Twin over Full Stairway Bunk Bed and Full Trundle - excludes Mattress. (Colors you see on your screen may not reflect actual colors because of the differences in computer settings and monitors). This bunk bed has been tested and certified by an independent laboratory. 4 drawers built into Stairway for additional storage. 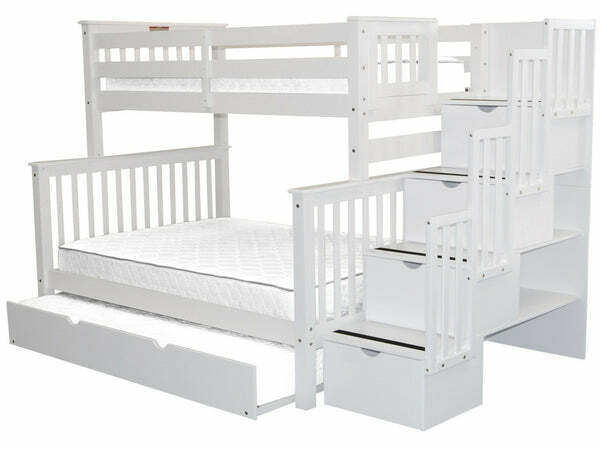 Set includes (4) Side Rails (2) Head Boards (2) Foot Boards (28) Wood Slats (1) Center Support for Full Bunk and (4) Guard Rails on both sides for the top twin bunk. (4) Drawers (4) Step Stairway access + (1) Full Trundle with (10) Slats and (1) Center Support. 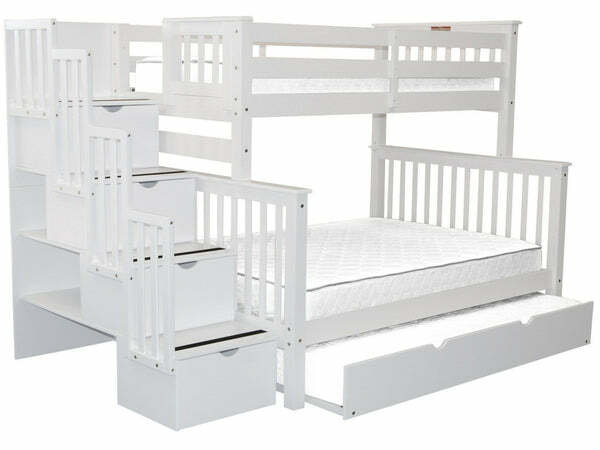 Total bunk bed external dimensions are approx 69 1/2 high x 103 1/4 wide x 59 inches deep. Bottom bunk is approx 10 3/4 inches off the floor - space between bottom bunk slats and top bunk slats (excluding the mattress) is approx 38 inches. Internal measurements of the Drawers are approx 18 wide x 15 1/2 deep x 8 1/2 inches high. Full Trundle dimensions are approx 9 1/2 high x 74 1/2 long x 55 3/4 inches deep. Trundle will accommodate a mattress up to 7 inches deep - The Bedz King mattress is 9 inches deep and will not fit the trundle. Ensure that you have sufficient space in your room to fully extend the full size trundle. Allow at least 60 inches from the front of the bed. Hardware and instructions are included and Assembly is required. FedEx Ground Shipping is FREE NATIONWIDE. .
You have successfully added to you cart. * Sales tax is added to orders from CA CO GA IL IN LA MD MI MN NC NJ NY OK PA SC TX UT WA WI. Free shipping is to the 48 states. We do not ship to Alaska, Hawaii, Canada, Puerto Rico, APO, and FPO addresses or PO Boxes.